So, here are the steps I’ve taken. I actually didn’t do them in this exact order, but I’ve reordered my steps to something more logical that you can follow along. 0. Start with CentOS 7. I’ll presume that you’ve already deployed a CentOS 7 host or virtual machine with the hostname of puppet. We’ll use the example.com domain, so that the FQDN of the machine is puppet.example.com. If you’re on XenServer, you can use one of my prepackaged images to boot up the OS. You can follow the rest of the guide as root, or use sudo. 1. Set up yum repo, install puppet-server. Import the official Puppet repository RPM. Now, install the actual master. Accept the prompts (including the ones about GPG keys). Do not start the services yet. 2. Configure basic settings for puppet server. Most of the details in the official guide’s post-install page apply here. 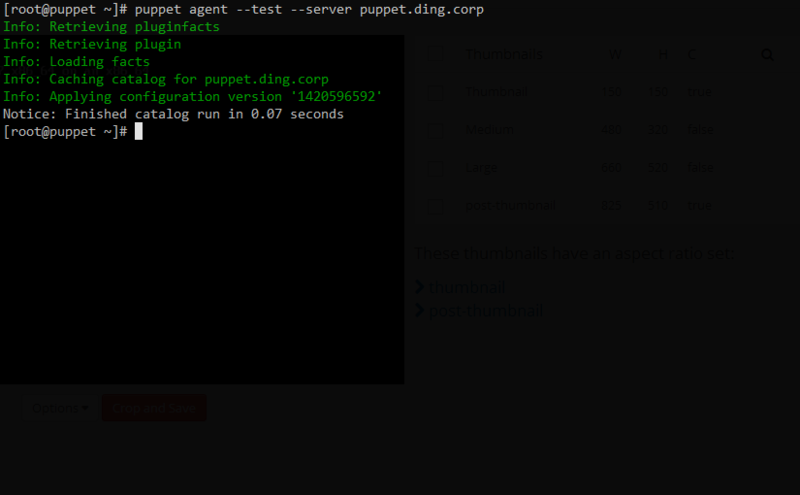 Set up the hostname of your server in the puppet configuration. In the [main] section of the /etc/puppet/puppet.conf file, add a dns_alt_names line. Obviously, replace example.com with your network’s DNS suffix. Once it spits out “Notice: Starting Puppet master version …”, use Ctrl+C to kill the process. If everything went right, your X.509 certs now exist at /var/lib/puppet/ssl/certs/. Optional: set up basic environment, modules. You should make a placeholder manifest. At this point, you might find it helpful also to configure a production environment in Puppet. I’m not sure if the following line is necessary, but it can’t hurt. Add this declaration to your /etc/puppet/puppet.conf file, in the [main] section. You can return to doing this later; it’s not important for the guide. 3. Install nginx and Unicorn. 4. Configure Rack and Unicorn. Copy the default rack configuration file and set its owner. Now, test the configuration by launching /usr/local/bin/unicorn -c /etc/puppet/unicorn.conf. (Note that the path to Unicorn is /usr/local/bin, which may not be on the path of the root user.) You’ll see something like the following, at which point you can Ctrl+C to quit (hence the last line). Once again, we borrow heavily from Mike Hulsman’s guide here. Be sure to replace puppet.example.com below with your actual FQDN, or whatever the filename of the generated certificate is. It might not be what you think it is, if DHCP has assigned a different DNS suffix. Add an SELinux module to permit nginx to communicate with Unicorn! This is the one step that might give people grief, since the Unicorn socket is created in a location that is tagged with the puppet_var_run_t SELinux type. Do not simply disable SELinux or put it in permissive mode! This module will allow nginx the permissions it needs to access the socket file that Unicorn uses. First, install some necessary tools. They might actually already be installed. Create a file, anywhere (even /tmp should be fine), with the filename nginx_puppetmaster.te and the following contents. Compile this SELinux module using the checkmodule command. 6. Configure systemd to launch and manage Unicorn. This is an area where we deviate significantly from the CentOS 6 guide. There should be no need for God when we have systemd to manage Unicorn directly. I took some hints from GitLab’s Unicorn systemd service file to come up with this. 7. Launch the daemons and test! Jan 06 23:40:58 puppet.example.com systemd: Started Puppet Master Unicorn Server. nginx should also show as running, though in at least one test it failed to start the first time, but worked the second. Jan 06 23:21:43 puppet.example.com systemd: Started nginx - high performance web server. If both daemons have started, you should try curl -k https://localhost:8140/ to verify that it can be accessed. You should just get a one-liner response: The environment must be purely alphanumeric, not ''. If you see a 502 Bad Gateway error instead, go back and verify that a) Unicorn is up and running, and b) you’ve configured SELinux as previously instructed. 8. Set up your agents on other nodes. That’s a bit outside the scope of this guide. You can just follow the stock documentation from here on. Has this guide helped? Did I get anything particularly wrong? Is there an easier way to work around SELinux? Please, feel free to chime in; your comments are welcome! thanks for this 🙂 this is exactly what im looking for, simple and straightforward tutorial! Previous PostPrevious Still calling it Threshold?